Sonila Zesllari ensures every year that she will be on hand at Juliette’s Place shelter for women and their children fleeing abuse when volunteers, Auxiliary and Police Officers deliver gifts to kids. 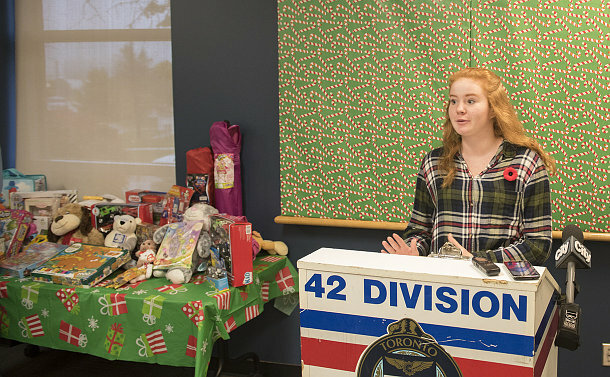 Zesllari was one of the Service and community members celebrating the kick-off of the 23rd Annual Toronto Police Auxiliary Toy Drive on November 5 at 42 Division. Last year’s toy drive supported nearly 3,500 young people in Scarborough. Deputy Chief Peter Yuen challenged the Auxiliaries to deliver toys for 4,000 children this year. “Anytime we can lend a hand to make a community better, it is our job and civic responsibility to do so,” he said. Grade Nine student Ella Gray joined the toy drive five years ago when, with the help of school friends and her mother, she collected 900 toys. Last year, they collected 1,300 toys. “I did that with friends at two schools and now I have four schools on board and we will be looking to get more toys,” she said. About a month ago, Gray joined the Mounted Unit as a volunteer, spending about four hours on Saturdays feeding and cleaning the horses and their stalls. All new, unwrapped toy donations are welcome but there is always a high demand for toys for boys and girls between 10 and 14. Unwrapped toys can be dropped off at 41 Division (2222 Eglinton Ave. E.), 42 Division (242 Milner Ave.) and all CIBC locations in Scarborough. In 1994, Auxiliary Superintendent Frank Fernandes fielded a phone call from then-police volunteer Rebecca Malin seeking assistance for some kids staying at low-cost hotels on Kingston Rd. 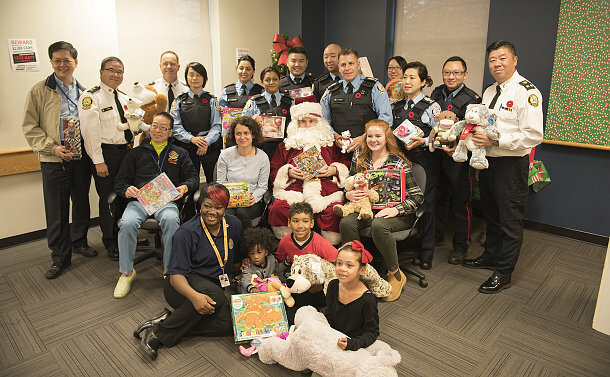 Knowing their families were not in a financial position to provide toys for the kids, Malin, now an Auxiliary officer, started a toy drive to bring smiles to the faces of children in women’s shelters and community centres in the city’s east end.